McRae takes the design concept and create these structures in the most structurally sound, and cost efficient way. Besides the spectacular imagery on fabric which we are known, for it is the actual engineering installation and transportation where we can really make the difference. Multi-sensory Experiences Virtual and Augmented Reality – In regards to technology trends, there are few bigger buzzwords right now than VR. That’s because it is particularly good for demonstrations and drawing a person in and fully engaging their senses with a presentation. This multi-sensory gem is more accessible than ever before due to most of your visitors arrive with a cell phone. It is particularly good for brands with large and cumbersome products: such as MRI machines and full size tractor. At McRae we have designed, fabricated and worked with partners to create VR pods which are pretty cool because of the combination of the materials we used and they are super transportable and easy to install. Simplified Representational Structure. – Companies want it to be immediately clear how and where their products are used. At the same time, they don’t want to fabricate structure that will obscure attendees’ view of their products from the aisle. So rather than going full representational structure many exhibitors are taking a minimalist approach and creating just enough structure to communicate what the environment is. McRae’s fabrication capabilities and engineering staff can look at the structure and make critical recommendations on how to build it, so the structures are light, secure, easy to transport and install. Discount generic Viagra online find at http://www.bantuhealth.org/viagra-buy/. Ok – this trend may be in conflict with the above trend but this is what we are seeing in the designs coming in. 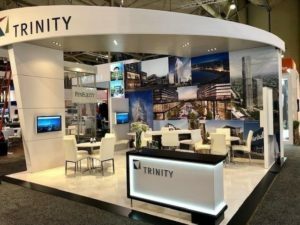 This trend embodies the idea of a display as an immersive experience that gives visitors the feeling of being transported off the tradeshow floor. Great booth designed is all about the customer’s sensory experience, from start to finish. We are seeing a lot of bold, textured details in exhibits; bright colors, specific lighting, textured details and unique signage with an attention to details like acoustics. Business owners and marketers are realizing that they aren’t limited to engaging visitors merely by sights and sounds. There are five senses in total, and it’s time that trade-show marketers appealed to all of them. The goal is to get people connecting with your brand, and according to the Harvard Business Review, amplifying the sensory qualities of your exhibit is the perfect way to do so. Now more than ever, professionals say, exhibitors need to figure out how to make attendees feel something positive if they want to be remembered beyond the show floor. “Whether you consciously think about creating an experience or not, you, your stand team, and your stand create an experience with every visitor who comes near to or into your stand,” says publisher David O’Beirne in his experiential design blog for Exhibitors Only. By working with a exhibit fabrication partner that have over 45+ years in the exhibit tradeshow space we have learned a few tricks up our sleeve around thoughtful structural design. Our fabricators craftsmanship with shapes and corners is at the highest level.